When I was at primary school we didn't have a school uniform and could wear pretty much what we wanted for school. Girls tended to wear dresses or skirts and I certainly don't remember any of the girls wearing trousers. 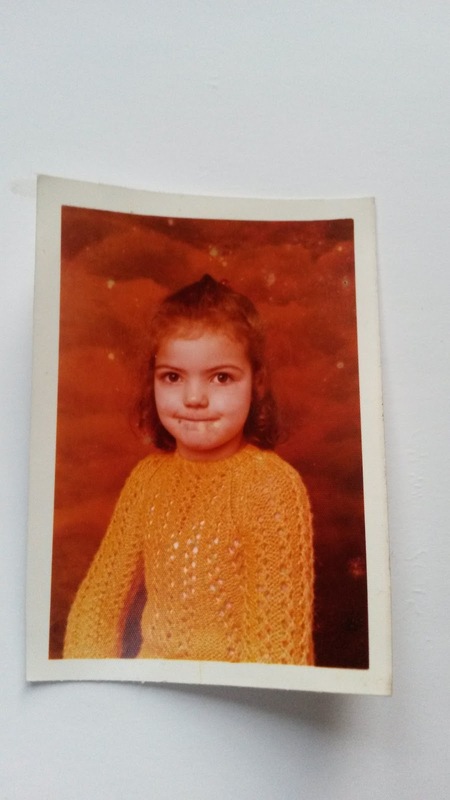 My Mum was a keen knitter and this meant that many of my school clothes were knitted! I remember being envious of my friend who always had gorgeous dresses and cardigans from Marks and Spencer whereas I had knitted jumpers, cardigans and even knitted dresses in many shades of brown, green, orange and other colours that were popular in the 1970's. We still live in the same village I grew up in so William and Luke both went to my old primary school, William left a couple of years ago and Luke is still there. They couldn't believe I didn't have to wear a uniform and Luke wishes he could wear what he wants rather than the brown and green uniform that he has to wear. As a Mum I am glad they have a school uniform, it's bad enough getting them organised in a morning without them having to decide what to wear too. It also means they are not under pressure to always have the latest and most expensive fashions. Neither of them liked the orange jumper that I am wearing in my school photo, I'm not surprised, I wasn't keen on it either and remember always making sure I wore a vest as the knitted jumpers could be quite itchy. Yellow Days blog is co-hosting a competition with Debenhams and have asked for bloggers to recreate their school uniform with items from the Debenhams Kidswear department. As I didn't have a uniform and not surprisingly Debenhams don't have a range of schoolwear in orange, I have created a uniform that I would have liked to wear at school and there is not a knitted cardigan in sight!! I like this grey skater pinafore dress, it looks nice and smart and can be teamed with these pretty white blouses. This red cardigan is the nearest to orange I can get and the frill around the bottom makes it look prettier. It is very similar to the cardigans my friend used to wear that I was very envious of. I always had sensible shoes for school but would have loved a pretty pair like these black quilted patent bow shoes. Ankle straps were very fashionable when I was at school and I would have felt very grown up wearing these. I was never allowed tights because if you fell you would ruin your tights whereas if you were wearing socks it was only your knees that suffered! I remember having white socks like these in my final year at primary school. I only had one pair and I could only wear them once a week as back then Mum had a twin tub washing machine and washing was such a performance that she only only washed on a Monday. She took some convincing to get an automatic washing machine but once she had she wished she'd got one sooner! Browsing Debenham's schoolwear section I came across this orange bag which I couldn't resist adding to match my orange knitted jumper! So there you have it, my 2015 school uniform - what do you think? Thanks for joining in with the comp, great choices! Good luck.